If you are looking for an amazing deal on stampin' supplies and/or a way to make a little extra money, Stampin Up! has a fantastic promotion for you! From June 1-30, 2010, you can start your own Stampin’ Up! business for just $99 with the special Mini Starter Kit! And... several of the items in the kit are from the *NEW* Idea Book! The Mini Starter Kit—valued at over $180—contains the items listed below; while all items are recommended, you can substitute a like item of equal or lesser value. 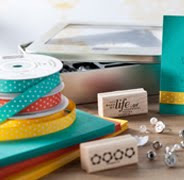 The Mini Starter Kit also includes the same business supplies that are in the standard Starter Kit. Plus, as a new demonstrator who joins Stampin’ Up! in June, you will receive a free box of 2010-2011 Idea Book and Catalogs during the first part of July! Interested? E-mail me and I can give you more information about all of the benefits of being a Stampin' Up! demonstrator and how to get started.